Thirty-one years ago, Tracy Muske was in a terrible accident that, surprising as it may sound, ended up saving her life — though it also cost her dearly. She and a friend were riding their bicycles on a sidewalk in St. Cloud, Minnesota, when a young man had a seizure while driving and crashed into them, she tells us. "My friend was killed, and I broke my back and one arm," Tracy says. She also found out she had cancer. Tracy tells us that shocking discovery came as an emergency room physician performed a routine rectal exam to make sure bone chips hadn't perforated her bowel. "He felt the mass immediately," she says. Because of Tracy's young age — just 23 years old — she says her doctors in St. Cloud were unsure of how to proceed. "They really didn't know what to do with me," she says. That's when her sister, Ramona Lansing, stepped in. "Mona was working in the Division of Colon & Rectal Surgery at Mayo Clinic Hospital's Saint Marys Campus at the time," Tracy says. "She asked around her floor … to see who the best surgeon would be to help me. Everyone said, 'Dr. Roger Dozois.'" Just a week later, Dr. Dozois performed the surgery to create a permanent colostomy that Tracy credits with saving her life. "I think his respect for my sister and the fact that I was so young is why he immediately said 'Yes' and then found a way to fit me into his surgical schedule," she says. "And to this day, I'm still cancer-free." 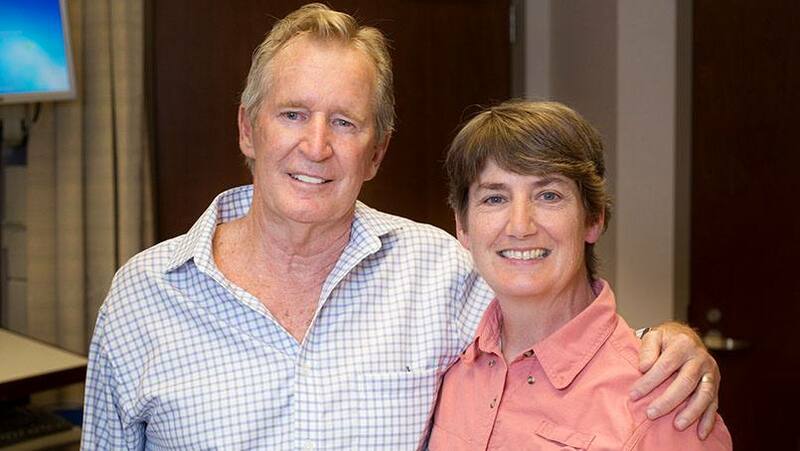 In the 31 years since, Tracy went on to see other doctors and Dr. Roger Dozois eventually retired from Mayo Clinic. Then, this past June, the two had an unexpected reunion. Tracy had called Mayo's Rochester campus to see who'd be performing her surveillance colonoscopy. "They told me it was going to be Dr. Eric Dozois … Dr. Roger's son," she says. "I was tickled pink." On the day of her appointment, Tracy told Dr. Eric Dozois the story of how his dad had saved her life. Dr. Eric Dozois told Tracy and her sister Mona, who was with her at the appointment, that his dad was actually in Rochester at the time. What he did next, she says, is something she'll never forget. "Dr. Eric asked if Mona and I would mind waiting around after my colonoscopy to see if we could have a phone call with his dad," Tracy says. When Dr. Roger Dozois heard who it was that wanted to talk with him, he did them one better. "After Dr. Eric called him, he said, 'Dad's actually on his way here now. He wants to see you. Do you mind waiting until he gets here?'" Tracy says. "I knew at that point … that this was meant to be." When Dr. Roger Dozois walked through the door, Tracy tells us she saw the same "sweet" and "amazing" physician she remembers. (Yes, they were tearing up, too.) "He hadn't changed a bit," she says. "It was wonderful to see him again and to have an opportunity to tell him that he saved my life, and to thank him for that." It was wonderful for Dr. Dozois, as well. "There are so many times when we, as physicians, lose track of our patients after treating them," he tells us. "So it was wonderful to see her again and to see that she's still doing well." You can help us do well by sharing your comments below. Then, you can use the social media tools to share this story with others. Love seeing a picture of Dr. Dozois. He also did 3 of my resections and I am forever grateful!